Large, spear- or arrowhead-shaped leaves on long stems rise directly from the tuber buried in the ground below. Depending on weather and soil, each leaf can grow up to 12 inches in length on 1-foot stems. 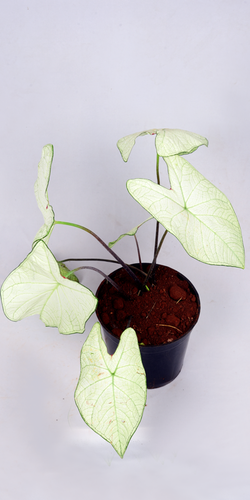 Caladium hortulanum is also a very popular house plant. In the right climate, you can keep it outside in summer when the weather conditions are right and take it inside in winter. Doorplants is the first exclusive app that caters to your gardening needs on the go. It is not only an online store, but also a service providing app that does all the gardening and maintaining work for you and keeps your home green and nature-friendly. Here are few of the many reasons to pick 'Doorplants'. From a wide range of creepers to flowering plants, medicinal plants to vegetable plants, shop and spread greenery for a better living. Get access to all the essentials required for gardening. We fulfil the needs of professional and amateur gardeners with gardening tools, and greenhouse accessories, to enhance their passion. We design and execute all kinds of landscaping properties including corporate and private. Our skilled designers will make sure that your every inch of the land is executed and nurtured to perfection. We make sure to monitor the growth of your plants and adhere to timelines in order to provide the best maintenance services. Rest assured while our dedicated team makes sure to maintain the quality, consistency and reliability of your plantations. Now gift for a cause with 'Doorplants'. Help spread the greenery by gifting your friends some fancy plants out of a wide range of Bonsai, Vaastu, Indoor and Outdoor plants. 'Doorplants' collaborates with events and promotions, be it a corporate product launch or a personal birthday party. You can brand logos or movie labels on cups or pots of the plants to increase your brand visibility and also give away something meaningful to your audience to promote your event. With our innovative ideas, leave a global green footprint for a better today and a brighter tomorrow. Our team of experienced gardeners and horticulturalists are motivated with a single aim in mind - to provide the best products and services for your needs. We are a bunch of committed, highly skilled employees who have a passion for our career and consider it more than just a job. Our landscaping professionals shall look after your greenery as if it was their own.